Employee engagement was considered the biggest challenge of 2018 by 41% of 447 HR Directors in the UK interviewed for an annual survey*. But, what exactly is employee engagement? Do your workers feel comfortable to challenge superiors and suggest alternative strategies and solutions to problems? If the answer is no, it might be time to empower them to do so. Not only can your business benefit from different perspectives and potentially more efficient solutions, your workers will feel they have a voice and are valued in the company. Internal communication strategy should be focused on informing employees of decisions being taken, changes and achievements in the company. But communication goes beyond that. It is also key to ensure workers are clear about what their roles entail, what is expected of them, what are their KPI’s and so on, preventing uncertainty on all levels. Involve workers on the decisions that will directly affect their role. This goes hand in hand with empowering employees, valuing them and giving them a voice. But besides that, it also improves morale and motivation and gives workers a sense of responsibility over the decision made, focusing more on problem solving. Your employee’s efficiency should be judged by results, not hours. Expecting workers to sit on their desks even when they have already finished their tasks and are delivering what is expected of them and more creates a culture of ‘presenteeism’ disengagement and boredom. Measuring output, rather than input, makes for a much more engaging and productive work environment, where employees are happier and more able to manage work-life balance. What can First Base help with? Our temporary staff are provided with perks including NHS approved 24h GP phone service, 1000’s of shopping and dining discounts and specialised counselling service. All of that in the palm of their hands, with our ground breaking mobile portal where they also have access to fully GDPR compliant payslips, insurance discounts and training by market leaders, plus much more. 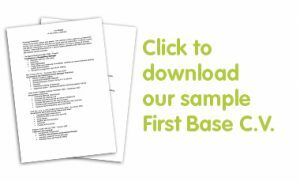 If you would like to know more about how the First Base team can help you with your organistions recruitment requirements or your next career move contact us on 01453 755 330. Adapted from an article provided by our payroll partner Hive 360.